This has got to be one of the coolest ideas yet. Making a disembarkation template for your vehicles. The idea isn't mine, I saw it on The Black Parade a while back and when he revisited it recently for another vehicle of his, I decide to try my hand at it. I took this to the Old Timer's League the other week and was dying to use it in one of my games. I even contemplated getting out of the Land Raider just so I could use it once. Turns out, I got my chance. And herein lies the problem with the template... at least for me. Whenever I go to get out, I'm usually in a confined space (since I've tried to funnel my enemy into a fire lane) and I'm right on top of them (because I plan on charging right in and killing them all). This means there is no room to put the template down really. And even worse is trying to get the thing down when you're parked on rubble, a crater, near trees, whatever. It's near impossible. But... the single best thing about making the template is that I've got a much better appreciation for just how big of a space I have to disembark from my vehicles. It's much bigger than I was actually allowing myself. Now, the guys I play against regularly don't really worry about deployment from vehicles, as long as you get your models kinda close, you're good enough. But if you need to know exactly, it might be worth making one of these things for yourself. Friggin' genius! I love ideas that are so obvious and brilliant, yet no one seems to think of them. Kudos to The Black Parade. 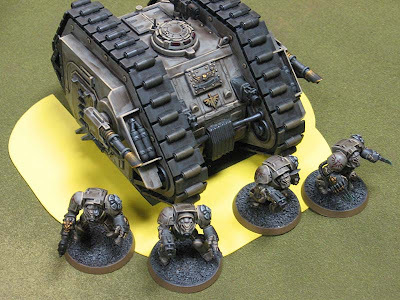 As for your problem, maybe put some plasticard legs on it so it sits above the infantry models so it doesn't get in the way of terrain and the like, but still allows you to go about an overhead view. Make the template out of clear styrene or some translucent material so that it can be used over the models. Cool idea made even better with Hudson's suggestion. I made one once out of some graph paper for my falcons and wave serpents. Showed me I had a bunch more room to spread out than I thought.